Technology has scrambled forward by true leaps and bounds in the last few years, making my Clinitest urinalysis kit of 1986 seem pretty archaic. Now, people touched by diabetes can see their glucose levels with a flick of their wrist, and there’s more on the horizon as far as data and diabetes management. Today I’m so happy to have Howard Look, President, CEO and Founder of Tidepool, sharing his personal diabetes story on SUM, talking about why he simply cannot wait. Our story is probably familiar: We were on a weekend camping trip and all together in our family-sized tent. Katie, now 14 but 11 at the time, had gotten up THREE TIMES that night, unzipping the tent and wandering with her flashlight to the campground bathroom. The next morning, breakfast was the usual campground fare – several glasses of orange juice and pancakes. By noon, Katie was throwing up. It was an exciting time in our family, full of possibility. Katie had just started 6th grade at a new school. She was making new friends, trying out for the softball team, and was ready for new challenges and a new chapter in her life. Who knew. Katie one week before diagnosis. I look at this now and realize how much weight she had lost. A day later, we were at Lucille Packard Children’s Hospital at Stanford. I just wanted someone to say “Don’t worry, your daughter is not going to die.” I wasn’t so sure. After a sleepless night and a morning full of words we didn’t understand (beta cells, boluses, ketoacidosis…) our heads were spinning. Fortunately, our day-one angel, Jen Block, looked Katie straight in the eye and calmly reassured us: “Katie, I just want you to know that everything is going to be OK. You are going to be fine. I have type 1 diabetes just like you.” Jen showed Katie her insulin pump and explained how she could have the same thing. In Jen, I could see a grown-up Katie. And finally I knew everything was going to be OK.
I’m a nerd, a Geek Dad. I’ve lived and worked in Silicon Valley since college and have been really fortunate to be a part of some really cool things: I was on the founding team at TiVo and was VP of Software at Pixar. Just prior to Tidepool I was VP of Software at Amazon. Like geeks do, I dove in to try to understand what T1D was all about. Katie had mastered computing doses and giving herself shots really quickly (great at math, that’s my girl) and we saw the value in an insulin pump and CGM right away. 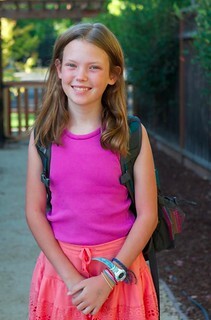 Within three months, Katie was on a pump and a CGM. I tried to get us up and running with the software that came with her pump. Bzzzzzt. No sorry, thank you for playing. It won’t work with your browser. OK, you made it work with your browser, but your plugin is out of date. OK, you updated the plugin but BEWARE: it’s an unsigned app that you shouldn’t trust. OK, you are willing to take that risk, but your new computer has USB 3.0 and the USB stick isn’t compatible with that. Some people wonder why almost no one uploads their pump data… I think I know why: because getting it to work can be like CRAWLING. THROUGH. BROKEN. GLASS. And remember: I’m a software guy, a Geek Dad… I usually LIKE dealing with this stuff. But I found that even if you could get it all to work, the software didn’t provide intuitive, actionable insights. To make matters worse, Katie didn’t like her first CGM. It hurt to put it in (we called it “the harpoon”) and it wasn’t accurate for her. Fortunately, the Dexcom G4 had just come out, which worked MUCH better. It hurt less and gave readings that were dead-on with her BGM. But unfortunately, Dexcom Studio is PC only we are a Mac family. I sorted that out (with Parallels for Mac), but still, we had one piece of software for the CGM, a different piece of software for the pump and BGMs, and no way to see it all together in one place. Why is this so hard? And WHY ISN’T ANYONE DOING ANYTHING ABOUT IT??? Scott’s article catalyzed me to take action. I met with anyone that would talk to me and looked for people who felt like I did. Jen Block introduced me to Lane Desborough (at Medtronic at the time), who introduced me to Aaron Kowalski at JDRF, who introduced me to Brandon Arbiter, who had invented this amazing app called Nutshell. I had found my peeps. Jen also introduced me to Dr. Joyce Lee, who connected me to Dr. Saleh Adi at UCSF, and to Steve McCanne, yet another Geek Dad (or as I called us “D-Dads with Attitudes”). Steve also has a teen daughter with T1D, and had been hacking some code to make it easier for Dr. Adi to review his daughter’s data, all in one place. When I saw what Steve and Dr. Adi and the team at UCSF had put together, I knew it was the start of something beautiful. Fast forward to now, early 2015. Tidepool has existed for just over a year and a half and I’m really proud of what we’ve accomplished in a very short period of time. As the hashtag says, #WeAreNotWaiting. 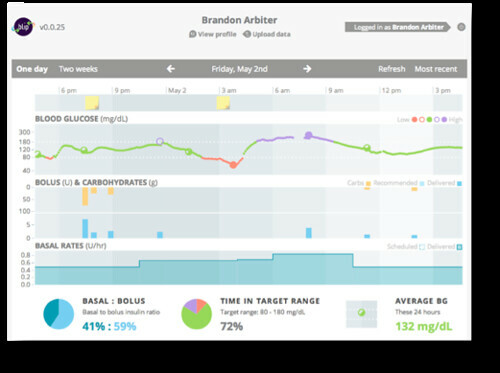 Our mission is simple: Deliver great software that helps reduce the burden of managing T1D. We are a non-profit. We’re not in this for the money. We’re in this to help make things better for the whole diabetes industry. By not competing, we can get more done. We are an open source project. This lets us leverage a vibrant, motivated community. It also means we are giving away the source code for free. We feel strongly that design and usability matter. T1D is a burdensome disease. You don’t need the software to be making it worse. We are building everything with the utmost attention to privacy, security, HIPAA and regulatory compliance. Yes, this is more work and takes longer, but without this, we can’t achieve broad distribution and help as many people as possible. Most importantly, we are helping the industry see the value in liberating device data. We’ve made it very clear: We believe that patients own their own health data. People should get to choose what software they want to use to for their diabetes therapy with that data. We’ve made great progress on the open data front: Asante, Dexcom, Insulet, Tandem and Abbott have all given us their data protocols. We also have great supporters at Animas and Medtronic and they are considering it. We will also implement and support the IEEE 11073 standards for BGMs, CGMs and pumps, which will make it that much easier for device makers to create interoperable products. What is Tidepool building, and where are we headed? The Tidepool Platform enables the next wave of diabetes applications. It’s secure, HIPAA-compliant and lets you choose how you want to see and share your data. We hope that it will foster a whole new ecosystem of applications that help reduce the burden of T1D. The Tidepool Uploader gets data from any diabetes device that has made their device protocol available. It’s a Chrome Extension, so it works with Macs and PCs (and Linux, too, if you’re a geek like us :). JDRF generously funded development of the Uploader. The project will also make it easier to gather data that will be useful to artificial pancreas researchers. 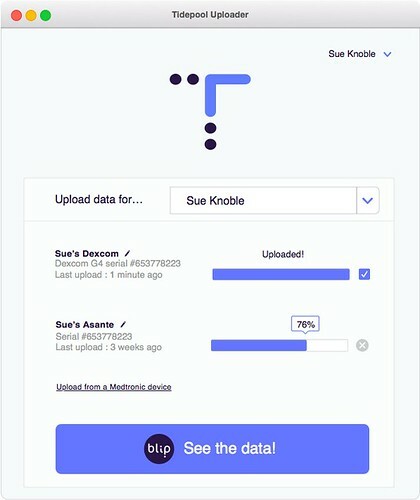 Blip is the home for all of your data. You can see it all in one place. You and the people who support you can use Blip to look, learn and make informed decisions together. Blip is currently being used in a pilot study at UCSF. We’re talking to other clinics like Stanford as well. We hope to have Blip ready for broad testing and deployment in the first half of 2015. Nutshell is a mobile app that remembers what you ate and ties it together with your diabetes numbers. The next time you order that burrito, you can figure out how much insulin you need with confidence. Nutshell currently exists as a working prototype and we’re looking for funding to take it further. We’ll be asking users if they’d like to donate their data to an anonymized research database. We plan on exposing that database freely. We also plan on creating the “Tidepool Query Language” and APIs that will enable researchers to easily use our platform to conduct studies based on device data. We will integrate fitness data from apps Strava and RunKeeper and devices like FitBit and FuelBand. Our platform is the perfect foundation for artificial pancreas research and commercialization. We’d love to build an advanced decision support interface that will help people and their doctors optimize their insulin therapy. We have a prototype of this called Sonar. Some device makers will choose to let us host their data and applications. For them we’ll need to expose APIs so they can access their device’s diagnostic data and let them connect directly with their customers. We hope to generate modest revenue by doing this so that we can become a self-sustaining non-profit. Most importantly, we need your financial support. So far, we’ve had some very generous donors who have supported us. Unfortunately the funding that we have received up to this point is not enough to get us to where we need to be. The good news is that we have a solid plan to generate just enough revenue to break even and become a self-sustaining non-profit, hopefully by the end of 2015. That means that you can think of your donation as an investment in the future of diabetes technology. There is no financial return on this investment since we are a non-profit, but you will definitely rack up Good Karma. There are other ways you can help to. If you are a developer, tester or UI designer you can volunteer as a contributor to the project. Join us at https://developer.tidepool.io for more detail. If you have experience with regulatory filings, you can help us with those. It’s a lot of work! If you want to stay in touch with us and hear about updates, you can sign up for our mailing list at tidepool.org, join us at facebook.com/Tidepool_org and follow us on Twitter @Tidepool_org. Thanks to Kerri for letting us take the mic for a little while, and to the entire diabetes community for your ongoing support of our efforts. Howard Look is the founder and CEO of Tidepool, a 501c3 non-profit with the mission of reducing the burden of managing diabetes through technology. Prior to Tidepool, Howard was on the founder’s team at TiVo where he was VP of Software and User Experience. He was also VP of Software at Pixar, where he led the team developing Pixar’s proprietary film-making system, and at Amazon where he ran a secret software project to develop devices that leverage cloud services. Howard has a BS in Computer Engineering from Carnegie Mellon University. His teenage daughter has T1D. We Are Not Waiting: CGM in the Cloud (Part 1). #WalkWithD: John’s Story. Go Bionic: Ed Damiano, Clara Barton Camp, and How the Bionic Pancreas “Really Works.” We Are Not Waiting: CGM in the Cloud (Part 2). Warning: The One About UTIs. I’m crying as I type this. I feel so frustrated with the lack of data that’s really accessible to me. I check my blood sugar faithfully yet never get a chart for it. Yes I can upload my Medtronic one, but they way Medtronic chooses to show it is terrible. If Medtronic doesn’t allow users to upload their data to this I will no longer be a Medtronic user. I’m so tired of them hoarding my information. It’s my data for Pete’s sake. Why does Medtronic want it. Arrhh. Thank you! Keep up the great work! well.. this was a good article.. I’m writing my own “cloud” based monitoring.. since I’m a database guy, I’m leveraging all things database.. from sqlite that runs on Android to MySQL on my database “cloud”. Issue1 : If you have a Dexcom, you’re sure to realize that sometimes the numbers go askew. There is no way, IMHO, that the artificial pancreas is going to be ready any time soon. As any “geek” knows, especially those of us with clustering experience, you need multiple sources to come with a decision (aka a quorum) . Even the strips can be way off. (ie. Dexcom says 100, strip 1 reads 180.. “sorry sweetie.. can you re-test one more time” .. strip 2 reads 110).. so I’m pretty sure you’d need two censors for a truly dependable artificial pancreas. Issue 2: I know I’m saying this from a Dexcom-centric view, and don’t get me wrong, the tech is wonderful, but it’s so lacking in features. Having “cloud” based views is a must.. and that’s one piece I’m working on. The other is having auto-alarms that takes the load off of us as “parent-creases”. There’s a difference between a low that’s hovering at 60-65 and one that’s headed into the 50’s. There’s a difference between a high hanging in the 140’s for an hour, and one where it climbs to 150 and heads back down. So what do we do now ? We set the alarms on our phone and even with the Dex, we check… That’s something else I’ve been working on. The frame of mind I’ve been going with when coming up with my solution is.. ok.. what do we do as parents to lower her A1C and how can I leverage my tech smarts to make our load easier..
Just hear this online recently – Progress is not the enemy of perfection– keep on plugging boys! Thank you!